For those men who like a unique piece of jewelry to wear then we have the perfect wedding band for him with the cobalt xf chrome 8mm two tone diamond wedding band. 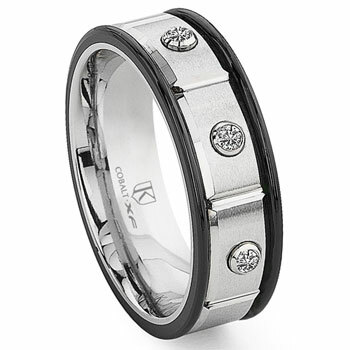 Made from white gold color cobalt chrome with a satin finish the ring has two dark edges and three 0.10 carat total weight diamonds mounted on bezels on the surface of the wedding band. The great think about this wedding band is that it is designed to last a lifetime just like a great marriage. Our cobalt xf chrome 8mm two tone diamond wedding band is crafted from a metal alloy that is nearly impossible to damage or harm. Unlike it's precious metal cousin the cobalt chrome ring does not misshape or break. It is also 100% hypoallergenic so it won't turn fingers green and is available with comfort fit design ensuring a lifetime of wearing comfort.